Tetracycline wasn’t discovered officially until 1948, but ancient Nubians might have brewed up its powerful bacteria-killing properties in their beer. Nubians living about 1600 years ago in what is now Sudan brewed beer for the usual reasons – thirst and revels. But they also may have used tetracycline, an antibiotic left over from the brewing, as medicine. Scientists George Armelagos and Mark Nelson published a paper in June 2010 in the American Journal of Physical Anthropology that seems to confirm this purposeful, ancient use of the chemical. The question of whether Nubians knowingly used tetracycline about 1,500 years early came up when Armelagos, of Emory University, found the stuff in bones from Nubia that date to 350 to 550 C.E. (common era). Some experts met this idea with skepticism. So Armelagos joined forces with antibiotic expert Nelson. Nelson used one of the world’s nastiest acids, hydrofluoric acid, to analyze the bone. Bone soaks this acid right up, and the acid dissolves the bone. 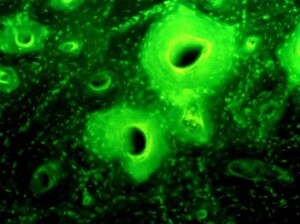 Chemicals trapped in the bone are then released for analysis. To their surprise, Nelson found that even a bone from a small child was steeped in tetracycline. This discovery, they argued, could mean only one thing: Someone used large doses of tetracycline to try to cure the child of an illness. Beer was an important product for societies from Europe to South America. Living just south of ancient Egypt, the Nubians – just like everybody else – used grain to brew their beer. The bacteria that make tetracycline were probably mixed in with those grains. Bacteria brew up antibiotics to fight other microbes, so tetracycline has powerful bacteria-killing properties. We use it today to fight many kinds of bacterial infections. It was “officially” discovered in 1948. 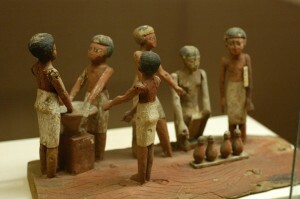 A scene depicting beer brewing in ancient Egypt, just north of the Nubian kingdom. Via WikiMedia Commons. Armelagos and Nelson argue in their paper that Nubians deliberately concocted antibiotic-laced beer to use as a drug. If Armelagos and Nelson are right, then these ancient Nubians brewed up antibiotics with their beer on purpose, about 1500 years before anyone “officially” knew what the antibiotic tetracycline is.